Who wants to party tonight? Put your hands in the air! 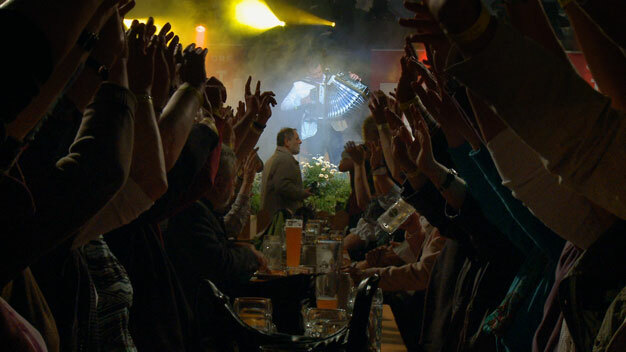 Whether at a tavern, beer tent or luxury cruise ship: Schlager star Marc Pircher is right at home on any and all stages. Even with record sales slipping around the world, golden albums are par for the course with his releases, and many of them go platinum. “At least you can make a living with my music” is how he responded to critics when receiving the Amadeus award—and was praised for his honesty. Between his almost daily performances Pircher shakes hands, poses for photos, gives interviews and takes care of the business. Marc is much more than just a musician, he’s a friend who never fails to come back. Even after two decades of doing this, his loyal fans swear that he’s absolutely reliable. And the affection is mutual: Pircher doesn’t hold back with praise, for either his enthusiastic audiences or the beauties of Austria. “That’ll never change,” he swears in the hit of the same name: Feel-good numbers are spiced with expressions of love for his homeland and subtle criticism of the EU, and the crowd goes wild. That’s another part of the Pircher brand. Marco Antoniazzi and Gregor Stadlober remain neutral but always stick close to the pop star while he lives out his dream—neither smirking at Pircher nor idealizing him. As if in an afterthought, they reveal the contradictory aspects of the glittering pop world and provide insight into the lucrative business with an always perfect façade. Smiling, laughing, high spirits. Climbing to the top requires never-ending hard work and precise management. It seems almost comforting when even the hardened pro briefly lets down his guard, at least in intimate situations: “One more record, then that’s it,” says Pircher wearily. All that seems to have been forgotten later, during his performance. One hundred percent stage presence, and one hundred percent party. It’s no accident that Marc Pircher continues to top the Schlager charts. A film guaranteed to give you the earworm effect.